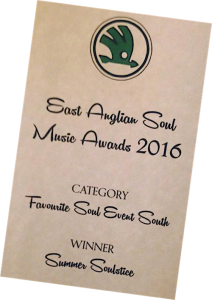 The East Anglian Soul Music Awards 2016, organised by soul music veterans Richard Routledge & Sean Owen, is fast becoming a must-go-to event on the soul calendar. This year’s awards was held in the town’s Burlington Palm Hotel & was hosted by DJ Bigger, a man well-known to Soulstice crowds. 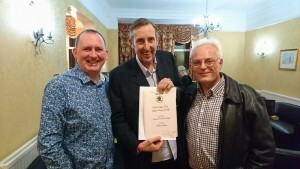 Among the other winners on the night was a Lifetime Achievement award for both Dr Bob Jones & DJ Max Rees, while Favourite International Holiday Event went to Bob Masters‘ Ibiza Soul Week & the Favourite Radio Station was won by Stomp Radio.